Is it a soft pillow or is it a plush, stuffed pet? You decide. With a simple to use, velcro closure, you can have a gorgeous giraffe pillow to lie on or a plush pet to cuddle up and play with. What a great design idea. 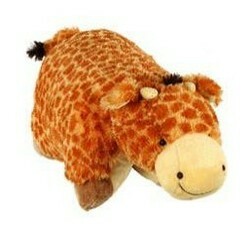 A Giraffe Pillow Pet makes a perfect gift to yourself or to someone who adores giraffes and safari animals. The gentle giant of the African Savanna makes a great choice of animal plush for all ages. The giraffe pillow pet is unique in the fact that it can be a plush stuffed giraffe or with a simple unfastening of the velcro closure, it unfolds into a flatter pillow shape which you can lie on. The dual functionality of this great toy means that it's perfect for travel, playtime, sleepovers and more. A very handy and durable plush giraffe for kids but also adored by so many adults too! Made from a really super soft chenille fabric which can easily be machine washed as often as you like - just pop into a plain pillow case and it comes out looking as good as new. Kids love playing with the snuggly giraffe and, when they're done and ready for a nap, just pop it open into a pillow. Pet or Pillow? You Decide. A Pet You Can Rest Your Head On! The giraffe would definitely work well for a bedroom or nursery (although they're not actually recommended like many toys for kids under 3) which has been decked out in a giraffe, zoo or safari animal theme. What a great gift choice. Aurora Plush Mo Giraffe Aurora Baby - 10"
Tip Top is a happy-faced giraffe and made of super-soft Pluffies material that's not only cuddly, but machine washable. Measures 10" tall. If the Giraffe pillow pet is out of stock on Amazon above then also look at your local eBay which often has these in supply. I've listed some on the left for you to look at. Not sure whether a pillow pets giraffe is right for you? 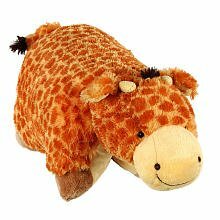 Handily, I've written many pages on the giraffe and have some listed below, including other plush giraffe toys and gifts which you might find more suitable. The graceful giraffe is a wonderful and gentle animal that is well loved by so many people for good reason. At home in its natural location of the African Savanna or Plains although you're more likely to see one at the zoo! It's great to teach kids about animals while they are young and safari animals are the ones they tend to encounter in their very first books and toys. I hope you discover some wonderful giraffe gifts. What do you think of the Giraffe Pillow Pet? Yes they are comfy for adults too. Thanks for your visit, Brenda. I'd like to have one of those for myself. Thank you Sheila, it is a cutie. This is an adorable pillow pal. Sounds so soft, too!